I recently found myself in a “bake a cake for no apparent reason” mood, and decided to try out a recipe that I had been holding on to for a few years now. 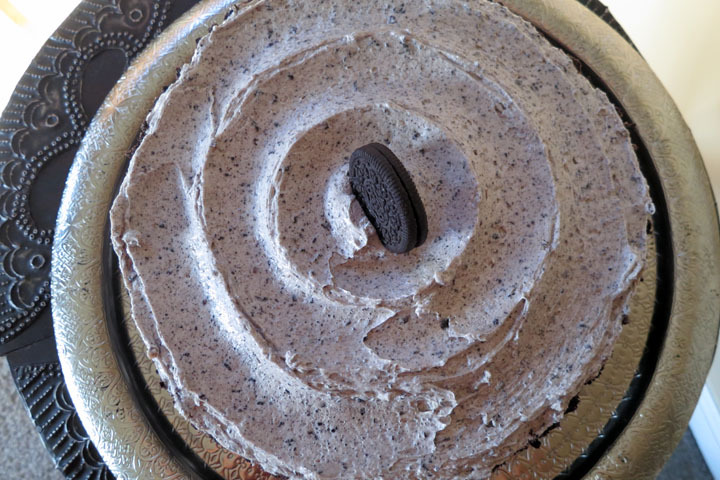 This Oreo cake is fairly easy, and open to modifications such as increasing the number of layers, adding or eliminating Oreo crumb layers, using your favorite cake recipe, and icing techniques. Preheat the oven to 350°. Butter two 9 inch round cake pans and line with parchment paper; butter and dust with flour. In a medium bowl, mix the sifted flour, baking powder, and salt. In a cup or small bowl, combine the milk and vanilla. In a stand mixer fitted with the paddle attachment, beat the butter at medium speed until light and creamy. Add the sugar and beat until fluffy, about 4 minutes. Add the eggs, one at a time, scraping down the bowl as necessary. Add in the dry ingredients in 3 batches, alternating with the milk mixture. Separate 2 cups of the batter and combine with the melted and cooled bittersweet chocolate. Set aside. Divide the remaining batter evenly into two pans. Dollop the chocolate batter over the batter in the pans and swirl with a knife. Bake in the lower third of the oven for about 35 minutes, until a toothpick inserted into the center comes out clean. Let cool for 15 minutes, then run a knife around the edges and invert onto a rack. Peel off the paper, turn the cakes upright and cool completely. To make the frosting, lightly whisk egg whites and sugar together over simmering water in a double boiler until egg-white mixture is hot to touch or a candy thermometer reads 140°F. Pour hot egg whites into the bowl of a stand mixer and whip at medium high speed with a wire whip, until double in volume and stiff peaks have formed. Meanwhile cut up butter into 2-inch pieces. Remove the whip and attach the paddle to your mixer. Add half the butter into the bowl and partially incorporate. Add the balance of the butter, starting with the lowest speed and increase the speed until you reach a medium high speed. Continue beating until the mixture begins to look light and fluffy. Stop the mixer and scrape the bowl. Reduce speed to low. Add vanilla and half of the Oreo crumbs, continue to beat on low speed for 45 seconds. Then beat on medium-high for an additional 45 to 60 seconds. To make a simple two-layered cake, first level off any rounded tops on each cake layer. Place the first cake, bottom side down, on your cake board or serving plate. Smooth a dollop of icing on top of it (thickness of your choosing), spread evenly, and then add the second cake layer on top, bottom side UP. Next put a large dollop of icing on top of the cake, smoothing with an offset spatula in an outward direction to eventually bring icing down the sides of the cake. Use the remaining Oreo crumbs to create a layer on the edges of the cake – use your hands to do this; it’s messy but not difficult. The Oreo crumbs also cover up any imperfections in your icing! The circular design on the top of my cake was made by using a soup spoon. With moderate pressure, drag the spoon in three concentric circles, and voila! 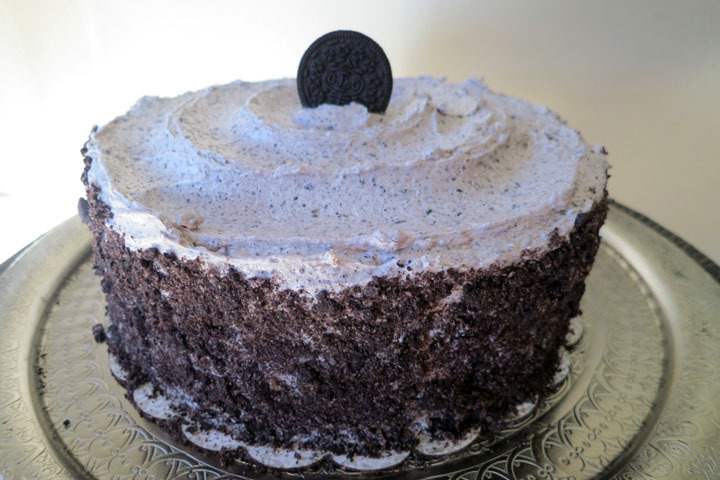 This entry was posted in Baking Jumbles and tagged cake, chocolate, cookies, cream, Oreo. Bookmark the permalink.